Editors Note: Reposting recipe with picture from Rachel! Yeah! We've started off the Cooking Club this year with quite the array of dishes. Most of them are ones I probably would never had made if it wasn't for the club. This recipe that Melidee submitted uses Hoisin sauce, so if you are going to buy it-then another great recipe for you would be one from last year Asian Style Pork and Noodles that also uses this. I haven't made this recipe yet and if Rachel has she hasn't posted her picture yet, so when I do the reviews in February I will post a picture. So happy cooking! 1. Whisk together the marmalade, soy sauce, hoisin sauce, ginger and garlic in a small bowl. Set aside. 2. Heat the oil in a large skillet over medium high heat. Cook the beef, scallions, carrots, and pepper for 5-7 minutes, stirring often, or until the beef is browned and cooked through. Add the soy mixture and cook, stirring for 5 minutes or until well blended. 3. 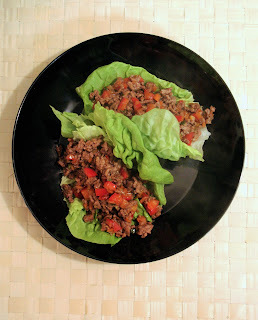 Spoon the beef mixture into the lettuce leaves and serve, or roll like a wrap to eat. And get ready! This Tuesday-February 1st, will be the day to link up with January's Ten Things To Smile About! This is your chance to reflect on the month and write a list (with or without pictures) that made you smile, laugh or just the simple good things from the month. You can see some previous lists here. That looks MOST delicious! I am going to try this one. I hafta ask you though, cuz I went to make the italian pot pie and I don't have ramikins...so can I make it in a 9x13? If it is anything like the PF Chang version, I'm all in!